[Editor's preface] This excellent and unique bibliography was helped by many members' generous contributions. It can be a starting point for serious collectors, whose specialized booklists we are happy to publish or link to here. Send them in! The compilers of this list acknowledge that more input is needed in identifying additional items, expanding descriptions, and in defining the criteria for inclusion. A name in bold suggests a standard "handle" for popular reference books. 147 prints in color. Japanese text; English titles. Also published in pb. 40 page sales catalogue with 145 illustrations, 16 of which are in color, all with information on artist, subject, publisher, dimensions, etc. Catalogue, 104 illustrations, most in color; substantial text on American woodblock artist who lived and worked in Japan in the first half of the 20th century. Exhibit catalogue; 96pp; all prints illustrated in b/w; extensive text and bibliography. With an essay by Watanabe Shoichiro, General editor Amy Reigle Newland. 2 volumes in slipcase, 288 + 304 pp; 690 color & 100 b/w illustrations, 20 watercolors. Exhibit catalogue, with two substantial essays reviewing the social and cultural history of the shin hanga movement. Brief references to shin hanga artists contained in a chapter on the influence of Japanese prints on western artists. Catalogue raisonné; 259 prints, 20 oils and watercolors in color. Reprinted in 1995. Twentieth century from roots in Kiyochika through shin hanga and sosaku hanga. 131 pp; 179 prints illustrated, all in color; Japanese text. Exhibit catalogue. Text in French. Catalogue of the Van Vleck collection at the Elvehjem Museum, a significant portion of which was originally collected by Frank Lloyd Wright. Several thousand small, b/w images, with basic artist, title, series, size and date information. Shin hanga artists represented include Hasui, Koitsu, Shoson, Shiro and Shinsui. Exhibit catalogue of Austin Collection, with 23 shin hanga prints in exhibit, of which four are shown in catalogue. Exhibit catalogue; 24 pages, with 10 prints illustrated in b/w. Limited text. Exhibit catalogue; 156 Meiji, Taisho and Showa prints illustrated, 24 in color. Japanese text. Exhibit catalogue; 76 prints illustrated, all in color. Japanese text, English captions. Exhibit catalogue; western artists Orlik, Capelari, Miller, Hyde, Bartlett, Brown, Lum, Keith and Jacoulet. 257 pp; extensive color illustrations; text in Japanese and English. 1st ed (1938) (86pp) - #24 of Tourist Library. All subsequent editions are hb and designated #10 of Tourist Library: 2nd (revised) ed. – 1949; 3rd ed. – 1953; 4th ed. 1954; 5th (revised) ed – 1957; 6th ed. – 1959; 7th ed. (221 pp) – 1962). Catalogue raisonné and extensive text on Bertha Lum, an American woodblock artist who frequently traveled to Japan in the first several decades of the 20th century. Approximately one third of the prints illustrated are in color. Great Collections of Modern Japanese Woodblock Prints [Kindai Nihon Hanga Taikei] (Tokyo: Mainichi Shimbunsha, 1975-6) 3 Volumes. Folio, cloth clamshell boxes, folding cardboard cases. [Kindai] Alternate titles: Outline of Contemporary Japanese Prints and Lyricism of the Taisho Era: The Art of Modern Prints. Has index of prints in English; rest of text is in Japanese. Detailed listing of books, articles, monographs, catalogues on Japanese prints. Hizo ukiyo-e taikan - See Ukiyo-e Masterpieces in Western Collections. Survey, with limited chapter on modern prints, including shin hanga. Exhibit catalogue, extensive text. 135 prints illustrated, all b/w; Goyo, Hasui, Shinsui, Kotondo, Yoshida represented. Modern and sosaku hanga dominate the catalogue. Sales catalogue; 154 prints illustrated, 16 in color, with titles, series, publisher, date, printer and dimensions provided. One page text introduction. 200 prints, all in color. Japanese text, with English print titles. Catalogue of covering Meiji, Taisho and Showa eras. 86 prints in color, Japanese text with English identification of artist, size of print and date. Ed: Tokyo dento mokuhanga kogei kyokai. 156 pp; mostly b/w illustrations; Japanese text. Scholarly, extensive survey of millennia of all Japanese art forms. Given the scope, only a few pages devoted to shin hanga. [Merritt 1990] Comprehensive, authoritative text covering the 20th century Japanese print. Exhibit catalogue; 72 pp; featuring Hyde, Capelari, Keith, Bartlett, Lum, Baldridge, Brown and Brangwyn. Extensive text on biographies and prints. [Merritt & Yamada] Comprehensive reference, with biographical notes on hundreds of artists, seals and signatures, notes on important print series, etc. MUST OWN. 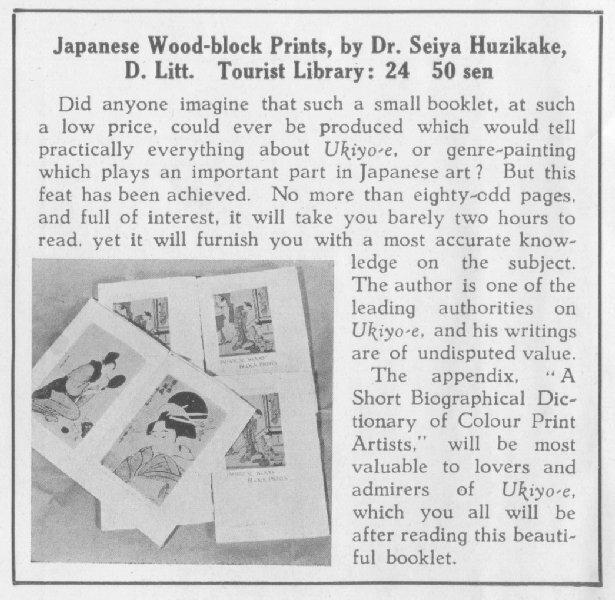 Michener's perspective on Japanese prints, illustrated with tipped in images. His discussion and illustration of shin hanga is limited since, as he says "it was a period with which I myself am not particularly attuned." Exhibit catalogue with extensive text and color illustrations. Scottish artist who lived, traveled and worked in Japan and the Far East for over 20 years beginning in 1915. Exhibit catalogue; 166 prints illustrated, 14 in color. Extensive text and information related to each print. [Toledo 1930] and [Toledo 1936] Reprint of the landmark 1930 and 1936 exhibit catalogues. Exhibit catalogue. Japanese text only. Broad historical overview of the subject, with a chapter on the Taisho era. That chapter covers the more popular shin hanga artists, without using the term. Catalogue raisonné of Kawase Hasui works. All Watanabe prints in color; all others b/w. Text in Japanese. Newland, Amy and Uhlenbeck, Chris, Ed., Ukiyo-e to Shin Hanga (New York: Mallard Press,1990) Folio hb. Well written and illustrated survey. Shin hanga chapter written by Haruo Matsuoka. Exhibit catalogue, with extensive text; 106 prints illustrated, nine in color. Some Meiji, in addition to Hasui, Hiroshi Yoshida, Shinsui and Goyô. Exhibit catalogue; 109 prints illustrated, 34 in color. Goyô and Shinsui make up about 40 of the prints. Japanese text. [Smith, Old Dreams] 150 illustrations, 50 in color. Shin hanga, sosaku hanga and modern. Also published by Harper & Row in New York. [Smith, Modern] 140 prints illustrated, all in color. Extensive text on each print as well as artist biographies. Also published by Cross River Press in New York. Exhibit catalogue; 80 pp; 50 prints illus., most in color and all with extensive commentary. Majority of prints are Meiji; limited shin hanga. Exhibit catalogue, 112 pp. 140 prints illustrated, about one-third in color. Japanese text; English index of prints. Prints and sketches by Goyô; four in color; Japanese text. Teihon Hashiguchi Goyô (Noberu, 1977) hb, cloth clamshell, cardboard outer case. Oversize catalogue of Goyô's works, including prints sketches and drawings. 64 pp. Text, plus 17 color and 62 b/w illustrations. Text in English and French, with b/w and color illustrations. Fold-out historical chart of Japanese printmakers, covering 1600 to 1900. Exhibit catalogue. Japanese, with some English text; 248pp; Taisho and Showa artists; both shin hanga and sosaku hanga works. 23 prints and 32 paintings illustrated, all in color. English and Japanese text. Exhibit catalogue; 43pp; Goyô and Hasui are two of the four artists covered. Mostly text, with some b/w illustrations. 134 prints in color, predominantly Koitsu, some Hasui, as well as Meiji works. Japanese text. Ukiyo-e Masterpieces in Western collections. The Robert O. Muller Collection [Hizo ukiyoe taikan. Muraa-korekushon] (Tokyo: 1990) hb, folio, clamshell case, decor. box. Beautiful publication documenting the Muller collection of Meiji and shin hanga prints. One of three volumes in this series, dedicated to important private collections in the West. Japanese text. Extensive, illustrated catalogue; text in Japanese, with some English titles and dates. [Watanabe 1936] Comprehensive sales catalogue. [Watanabe 1955] Comprehensive sales catalogue. Send in your comments, additions and feedback.